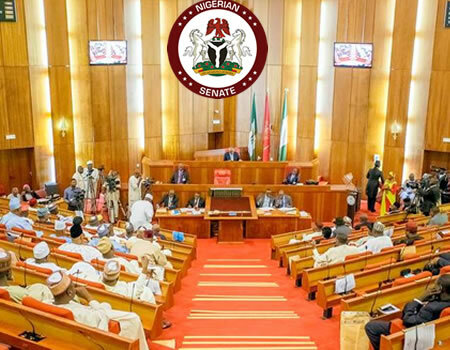 The Senate yesterday refused to confirm four nominees picked by President Muhammadu Buhari on the ground that the south-south and south-east regions of the country were not represented. It also declined to confirm the appointment of nine others onto the board of the Independent Corrupt Practices and Other Offences Commission (ICPC), saying the nominations were lopsided. Buhari had sought legislative approval for Moses Ndasule, Lawan Mamman, Galadanci Najib, and Adeleke Rafiu to serve on the board of the Economic and Financial Crimes Commission (EFCC). The nominees were screened by the Committee on Anti-corruption and Financial Crimes, which presented its report on the floor of the chamber during plenary. In the report presented by its chairman, Senator Chukwuma Utazi (PDP, Enugu North), the committee recommended their confirmation on the basis of their “qualification, experience and suitability” for the job. Utazi, however, said the committee observed that the nomination excluded other geopolitical zones. “The committee observed that three out of the four nominees were from the north central, northeast and northwest geopolitical zones, with only one nominee from the southern part of the country, that is southwest. “The committee notes that this is not in strict compliance with the Federal Character Principle as provided for in Section 14 (3) of the Constitution of the Federal Republic of Nigeria. The committee makes this observation to guide the executive in future nominations,” Utazi said. Trouble started when Senator Victor Umeh (APGA, Anambra Central) rose to oppose the nomination on the premise that it would send more wrong signals about the fight against corruption. Umeh said it was wrong for members of the EFCC board to be appointed from the northeast and southwest zones, which had already produced the chairman and secretary of the commission. “Mr. President, we have continued to say that there is need to accommodate all parts of Nigeria in activities of government, particularly in appointing people into agencies of government. That has been the practice in this chamber, and on this issue of fight against corruption, the EFCC is a very important commission because the fight involves all parts of Nigeria. “People are investigated in all parts of Nigerian and the commission cannot fight corruption to the satisfaction of all Nigerians if some parts of the country are not represented on it,” he said, urging the Senate to be “bold enough” to step down the consideration of the report and return the nomination to the presidency. Senator Mathew Urighide (PDP, Edo South), who supported Umeh, said the exclusion of the southsouth and southeast painted a picture that people from the zones were the “real criminals” in the country. He also called on the Senate to step down the consideration of the report until it reflected federal character. Asked by Senate President Bukola Saraki to give more information on the composition of the EFCC board, Utazi said there were six positions, including chairman and secretary. He said the positions could go round the six geopolitical zones of the country and give everyone a sense of justice. He described the “lopsidedness” as unfair to the excluded zones. But the Majority Leader Ahmed Lawan (APC, Yobe North) said the committee’s recommendation should be approved because it did not breach the EFCC Act, which is silent on the zones from which members should be appointed. The session eventually turned rowdy as more senators made heated contributions to the debate. This forced the lawmakers to go into a closed-door executive session that lasted about 15 minutes. On resuming plenary, Saraki said the senators had resolved to step down the report for further legislative work. The House of Representatives Committee on Aviation meanwhile has threatened it would not allocate money to the aviation ministry in the 2019 budget. The committee’s position followed the failure of Minister of Aviation Hadi Sirika to appear and account for the performance of the 2017 and 2018 budget. The Chairman of the committee, Nkiruka Onyejiocha, said it was unimaginable that Sirika, a former lawmaker, would keep the committee in the dark on activities of his ministry. “This has been happening over a period of time. We can no longer take it, as we must deliver on our mandate. Nobody can take us for a ride,” she declared.